Recently, I had the pleasure of visiting Oahu for a short weekend trip. We were fortunate with perfect, sunny weather during our stay. We ate many things, and one thing we really enjoyed was Nana’s Green Tea. Nana’s Green Tea is in the back of a Japanese food court, Waikiki Yokocho. Their menu is filled with drinks and desserts. The prices are not cheap at all, but the quality is decent. I’d recommend the soft serve or parfait desserts. We tried both matcha soft serve & hoji soft serve. While everyone is familiar with Instagram-friendly matcha, we were introduced to hoji tea. Hoji is roasted tea that has a more subtle, darker flavor. I think hoji soft serve could make it big as an Asian dessert. 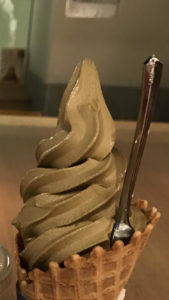 As someone who follows food news, I’ve never come across any hojicha coverage, but matcha is covered all the time. Hoji isn’t as Instagram-friendly (perhaps swirl it with matcha), but the flavor sells itself. This entry was posted in Food and tagged greentea, hoji, icecream, matcha, nanas, oahu, softserve, tea, waikiki on March 27, 2018 by Rex.